Amazing Large Bronze Garden Sculptures for Sale! The Most Amazing Bronze Garden Sculptures for Sale! I have always been fascinated by bronze statues! I love the color of bronze and I am also crazy about garden sculptures…. When I saw these amazing and very impressive life-sized solid bronze garden sculptures for sale I just couldn’t believe my eyes! They are extremely detailed and very cool! 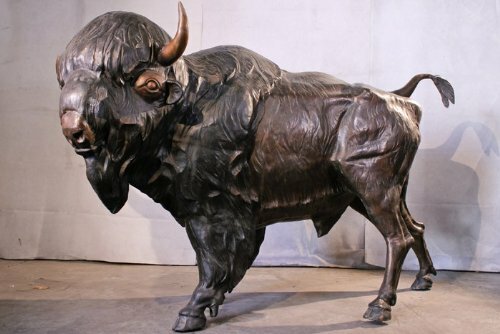 On this page I am showing you the most impressive ones I found, such as this solid bronze buffalo sculpture for sale! *If you want any of these amazing solid bronze sculptures in YOUR own garden, just click on their pictures to buy one for you. 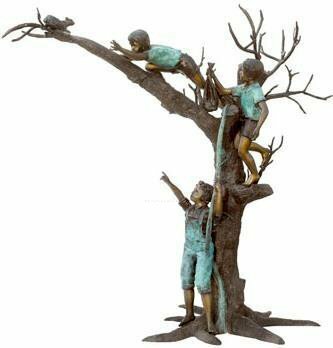 This is a life-sized solid bronze sculpture of three boys on a tree chasing a squirrel! One boy is climbing the tree, another one is already all the way up the three almost getting to the cute squirrel and the other boy is at the bottom of the tree pointing up! This is such a cool and unique piece that I bet you would have people in your home all the time asking you to take a picture next to this sculpture! Best Bronze Statues for the Garden! This is one of the most gorgeous solid bronze children sculptures to have in the garden! 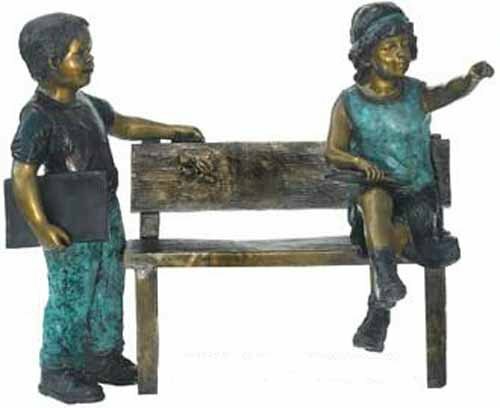 It is a very cute statue of two kids by a bench! 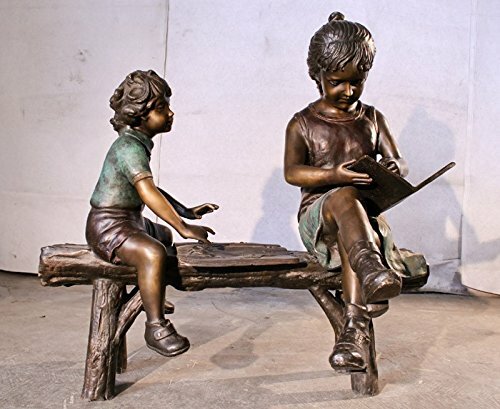 Another very cute and very unique bronze sculpture of two kids reading on a bench! The little girl is holding a book and getting ready to start reading a fun story! The other child has her book resting on the bench. They seem to be practicing their reading skills! I love this antique bronze finish! Great piece to have in your garden! 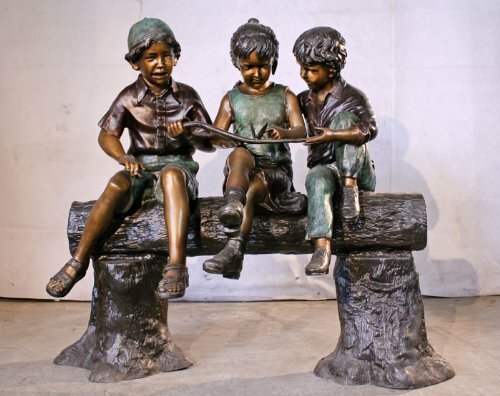 It is a solid bronze sculpture of three kids sitting o a log! There are two boys and a girl. This sculpture will last forever and can definitely be passed down from generation to generation! Perfect for parents who have three kids! My jaw is dropping now! 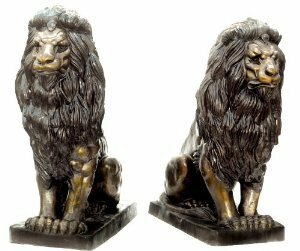 It is a magnificent pair of life-sized seated lions bronze statues for sale! I am mesmerized by these incredible solid bronze sculptures! 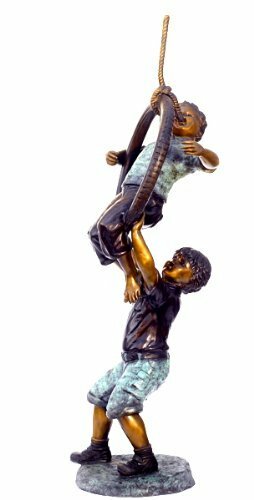 It is an amazing piece of two boys playing with a tire swing bronze statue! Very unique and very creative! This is a life-size sculpture. Perfect to have in your front garden! Great gift idea for parents of two boys! Your real boys can take a picture right next to them doing the same thing! 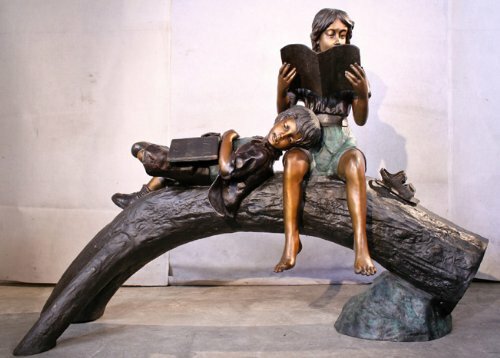 Another magnificent life size solid bronze statue of a boy and a girl reading and resting! We can also see her sandals on the log! What an amazing piece to have! 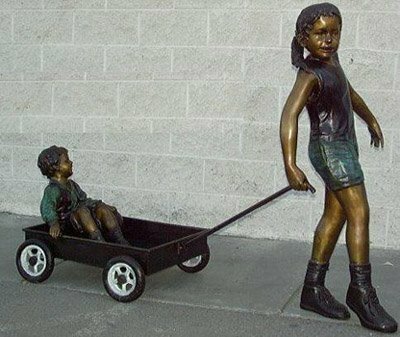 How amazing and very unique and creative is this solid bronze sculpture of a big sister pulling her baby brother on a wagon? Isn’t perfect for the parents of a boy and a girl? Don’t you wish you had a very large garden (and a lot of money! :))to have several of these? Here is one of the most impressive and beautiful bronze garden sculptures in my opinion! 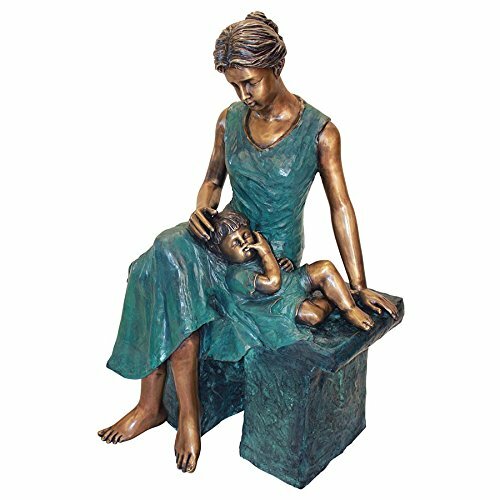 A mother has her little boy sleeping on her lap while she touches his hair… It has a gorgeous antiqued emerald verde finish and classic sepia bronze. All handmade and created to last a lifetime! A very unique piece to have by a lake, pond or flower beds… It is also over 4 feet tall! Perfect to take pictures next to it too! 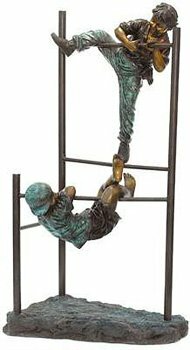 Another gorgeous and very cool monumental size solid bronze statue of two gymnastic boys! Your ‘real’ boys are gonna love having this piece in the garden! I am stunned by all the details! They were hand-rubbed to enhance all the colors and details! This is a piece that can be displayed not only in your home, but also in any business establishments or parks. *I hope you enjoyed these unique bronze garden statues on this page! Here are more of my favorite creative child sculptures! *Have you ever wondered how bronze sculptures are made?